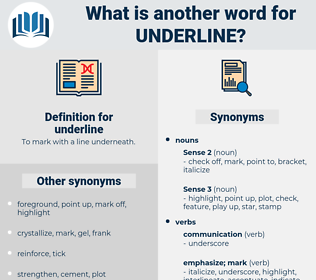 What is another word for underline? To mark with a line underneath. underlined, underscore, emphasized, highlight, highlights. 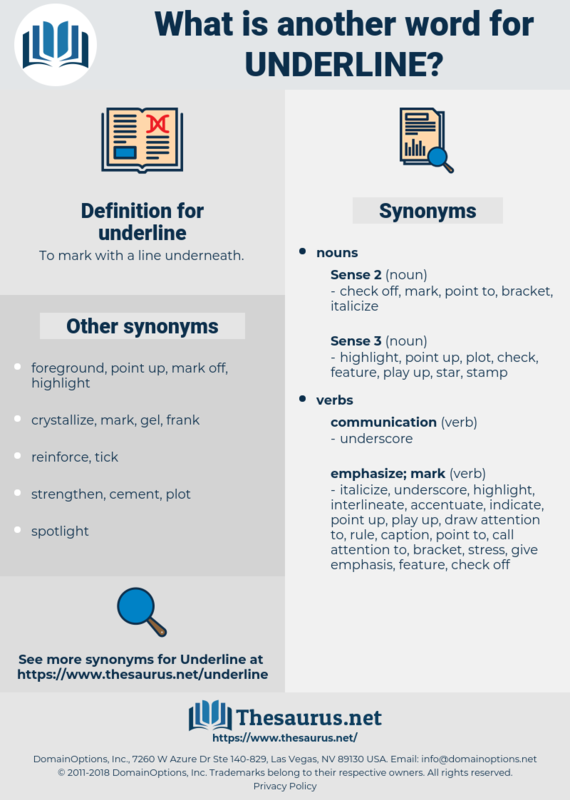 underscored, emphasised, highlighted, emphasize, emphasized, highlight, highlights. Reiterated, outlined, assured, demonstrated, Indicated, confirmed, suggested, included, pointed, Urged, identified, signalled, Mentioned, recognized, Argued, reported, noted, asserted, advised, Cautioned, Remarked, showed, drew, Echoed, said, added, felt, concerned, voiced, observed, Commented, stated, raised, affirm, affirmed. indicates, reinforces, affirms, suggests, explains, reveals, identifies, insists, signals, honours, argues, contends, notes, advises, cautions, shows, submits, observes, points. lay, confirm, confirming, underlie, accentuate, underpin, illustrate, demonstrate, insist, mention, remind, indicate, reinforce, assure, overemphasize, recognize, reveal, illuminate, say, point, affirm, commemorate, recall, reflect, clarify, disclose, show, identify, re-emphasise, restate, repeat, impress.